Thurgood Marshall was one of the most influential individuals to make a lasting impact in American history. Because of his contributions we have seen sweeping changes in the laws of the United States in regards to Civil Rights. They even nicknamed him “Mr. Civil Rights”. Coincidentally, Chadwick Boseman (aka “Mr. Bio Pic”) stars as the freedom fighting lawyer in Marshall. Marshall evoked some interestingly mixed reactions from me, however. It’s no secret the Chadwick Boseman is one of the most talented actors in Hollywood. Despite looking nothing like the real life Thurgood Marshall, his acting helps you forget about that soon into the film. Boseman brings out a type of bravado and charisma that makes it almost impossible not to be drawn to his character. In various scenes, Boseman displays a bit of of his acting range, but his best highlights will come in his wise-cracking comments. It almost felt like the only thing missing with his character was to have him break the 4th wall and wink at the audience during certain scenes. 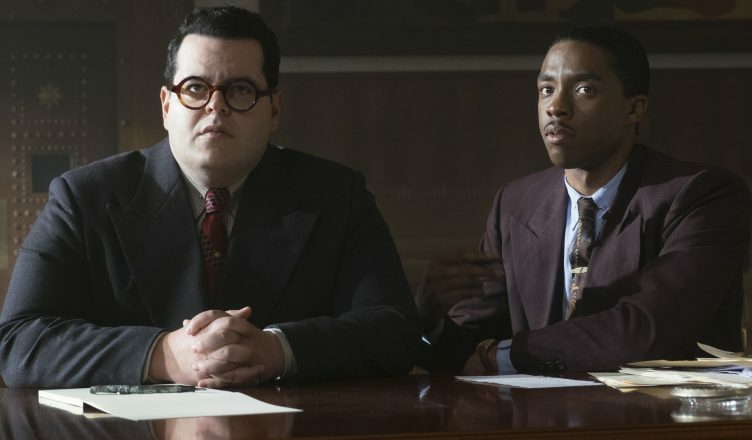 Josh Gad, Chadwick Boseman and Sterling K. Brown in MARSHALL. In addition to Boseman, Josh Gad put on a good show too. Gad’s character probably had the most development and growth throughout the film. He and Boseman had extremely good on-screen chemistry, and you’ll enjoy when they’re on screen together for the most part. They share a particular scene in the court room that had the theater almost screaming with laughter. I’d be remiss if I also didn’t give some props to Sterling K. Brown. Even though he was in a supporting role, he still manages to carry his scenes rather effectively. I appreciated Director Reginald Hudlin for making sure to really capture the emotion from Sterling in some specific scenes. As for the story, I must say that the court case itself is full of twists, turns and drama. It almost feels like an episode of Law & Order. 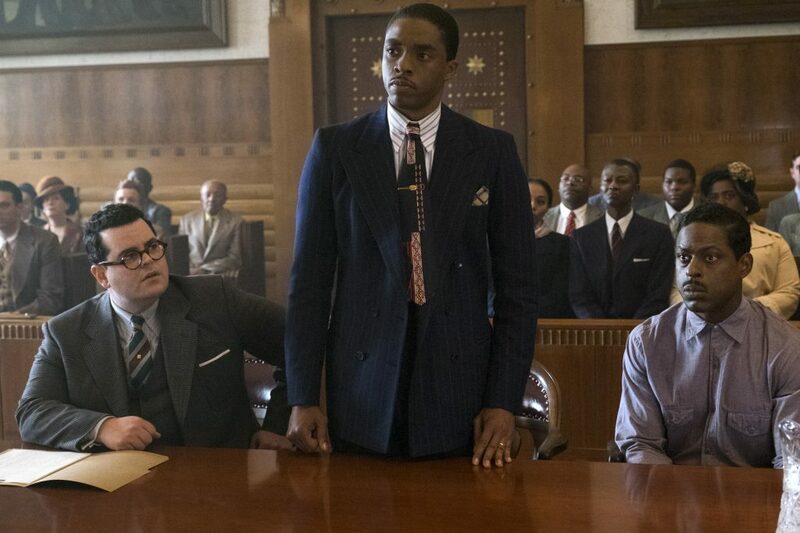 It was probably one of the most unique court trials that I can recall in a film, given some of the particular challenges that Thurgood Marshall had to face. You’ll stay engaged with the court case all the way to the very end. I especially appreciated how the film teases some of the issues of the past that are still relevant even in today’s world. So much so, that if you pay close attention, you may recognize some interesting cameos from some important people in the film. 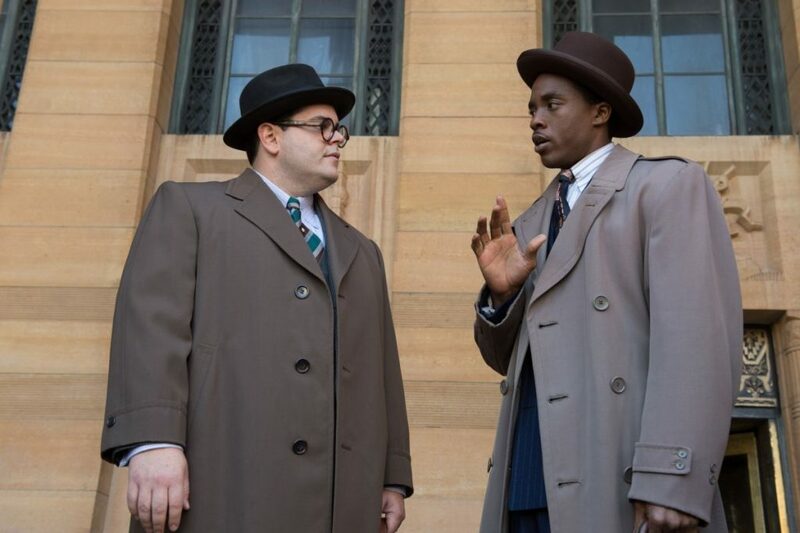 Chadwick Boseman and Josh Gad in MARSHALL. As the headline of this review suggests, this movie didn’t feel like a biopic for Thurgood Marshall. Marshall barely feels like the lead character in his own film. Instead he’s reduced to being a co-star with Josh Gad’s character. As the movie progressed, I kept asking myself, “Wait a minute, just who’s movie is this supposed to be again?”. As I mentioned above, Gad’s character gets to develop over time and Marshall is not given the same treatment. The only historical facts we get about his life are quick blurbs in random dialogue. The film chooses to focus only on one of Marshall’s smaller cases. While the case is indeed compelling, it’s probably not one of those cases that will speak to the greatness of the man who eventually changed history. Let me say, however, I don’t believe this film should’ve been about Thurgood Marshall fighting in the famous Brown v. Board of Education case. The question becomes, was this story the best one to really represent Thurgood Marhsall, and perhaps, his legacy? 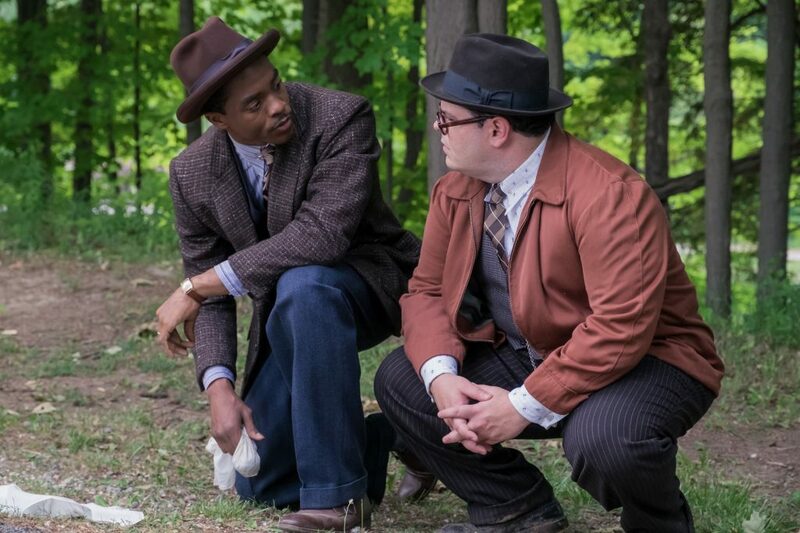 It just felt as though this movie, and this case, didn’t NEED Thurgood Marshall in it. You could’ve replaced Chadwick Boseman, and everyone else, and just had a black lawyer trying a case in a racist time in history. To put it plainly, this movie feels as though it simply hijacked Thurgood Marshall’s name just to make a movie. If you couldn’t tell by now, I was really disappointed in this film basically being an odd-couple, buddy-lawyer type of movie. Please don’t confuse my disappointment with the actual quality of the film. The film itself I really enjoyed. (Wouldn’t even mind watching it again.) My disappointment is derived from the manifested expectations from the marketing and the title of the film. If you think you’re going in to see a movie about the life and times of Thurgood Marshall, then you’re sadly mistaken. Now, if you don’t mind watching an entertaining and court drama, then by all means get your popcorn ready. To be honest, I suppose it makes sense to push Gad’s character. It makes the movie appear to be more open to the general public. It’s not going to be pigeon-holed into becoming just another “black movie”. Marshall suffers from what I’d like to call the “Hollywood Coffee & Cream Effect”. It’s kind of like how it sounds. When you have a story about a Black figure or black experience depicted in a film (the coffee), you have to introduce a white character (the cream) to help sweeten the film for all. Coincidentally, this is exactly what happened with Boseman’s other biopic “42“. The film was promoted to be about Jackie Robinson, but instead Harrison Ford’s character gets poured into the film to create an artsy looking cappuccino you’d get from the barista. Marshall is absolutely worth the watch in theaters. I do think that where you see this movie will matter. Let’s just say that the demographic at my viewing of the film wasn’t opposed to laughing and engaging with the movie verbally. That certainly helped me enjoy the film a bit more, and appreciate some of the more humorous moments. Had I seen the film alone, or in a super quiet theater, I think that the tone of the film might have shifted. So go see it with some friends or on a group date. My fear is that this movie will be enjoyed and then soon forgotten. I’m not sure it will really inspire people to really get to know more about Thurgood Marshall’s life and impact in history. Thankfully, I made a video (below) for you to watch so you can see just how cool this man really was. See Marshall in theaters now! Be sure to follow Eman’s Movie Reviews on Facebook, Subscribe on YouTube, or follow me on Twitter/IG @EmansReviews for even more movie news and reviews!